I’m making the Potato Leek Soup right now (as promised to my 8-year-old, Sammy, last night, based on his adorable comment). I realize as I wait for the soup to simmer away that I should also give you my stock recipe. There is probably nothing as comforting as the smell of veggie stock simmering away on the stove. The aroma fills the house with its age-old medicinal power to cure what ails you. Stock recipes don’t vary much across the board but the original idea for this one in particular came from a cooking class I took at Harvest Restaurant with Chef Michael Potters. He sautés the veggies before adding water. I don’t. I just stick it all in a big pot and let it stew away. He also adds wine at the end which I don’t. For me the jury is still out on that one. I know a lot of chefs who roast their veggies beforehand which gives the stock a deeper flavour and a bit more sweetness. However you decide to make it, make a huge batch in a big stock pot and then freeze it in different size containers. I love having stock around for soup, risotto, paella, or just cooking vegetables stove-top. I’ve come to believe that it’s one thing you should never buy because there is no comparison between home-made and store-bought stock. Freeze it in large containers (for soups etc.) and small (ice-cube trays for sautéed veggies). Use liberally. 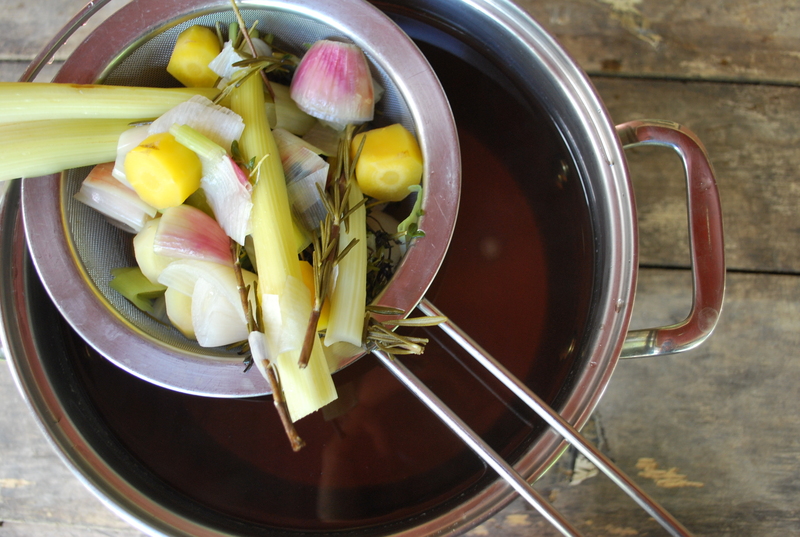 Put water in a heavy, large stock pot and bring to a boil over high heat. As the water is coming to a boil, clean and chop onions, carrots, celery, leeks, and fennel. Add them to the water. Next add the garlic, bouquet garni, peppercorns, and bay leaves. Once water reaches a boil, turn down the heat and simmer gently for 10 – 20 minutes, skimming the surface of the stock to eliminate residue. If you want to add some wine, add a cup or so and let it simmer for an additional 10 minutes. If not, turn off the heat and let the stock cool before straining out the vegetables. The stock will keep for up to 1 week in the fridge, or can be packed into containers and stored for several weeks in the freezer.